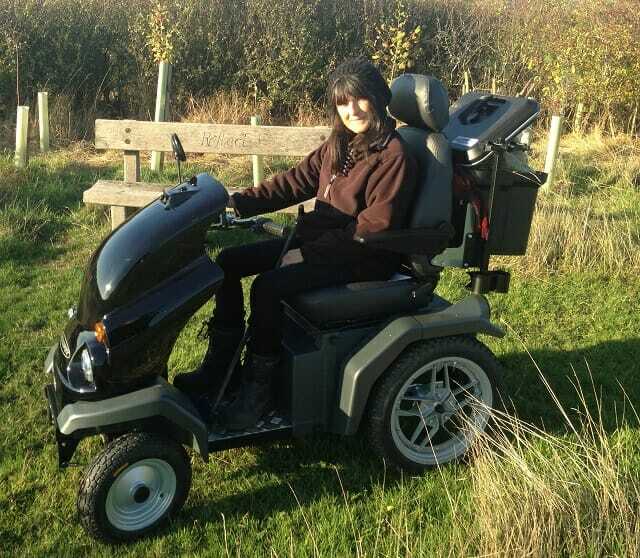 Last week we took delivery of our first Tramper – an off-road mobility scooter. 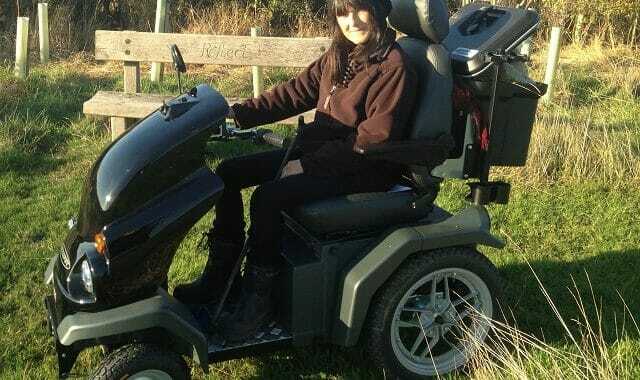 Not only will it allow me to get around the site where otherwise I needed a car, but it can be available for others whose mobility is limited. 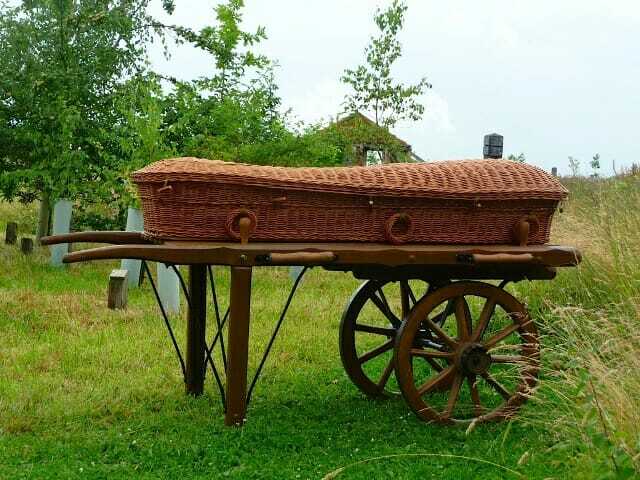 Whether visiting a loved one laid to rest here, or coming for a funeral, with enough notice and preparation, we can have the Tramper onsite for you. We’ll give a short lesson in how to use it, and then leave you to explore. If the person needing it can’t manage to operate it, it is also possible for someone to walk slowly alongside and operate it for them. It doesn’t take away the bumps, and it isn’t foolproof, but if driven gently and slowly it can take all the way to the far side of the nature reserve those who haven’t managed to get there before. For those who are a little wobbly on their legs, as I am, this extra help is a real joy. Pausing for a quiet moment, with a very different view before us, a very different perspective on the landscape, can be so enormously valuable. Apart from the occasional oxeye daisy, devilsbit scabious or knapweed, most of the wildflowers at Sun Rising have now gone to seed. With the scorching heat of the dry summer months, this has happened a good few weeks earlier than in previous years. Although we are gently beginning some harvest clearing, strimming areas of tall grasses, fescues and bents, that have started to fall and look tatty, the meadow is still so full of life we are loathe to cut and bale it yet. 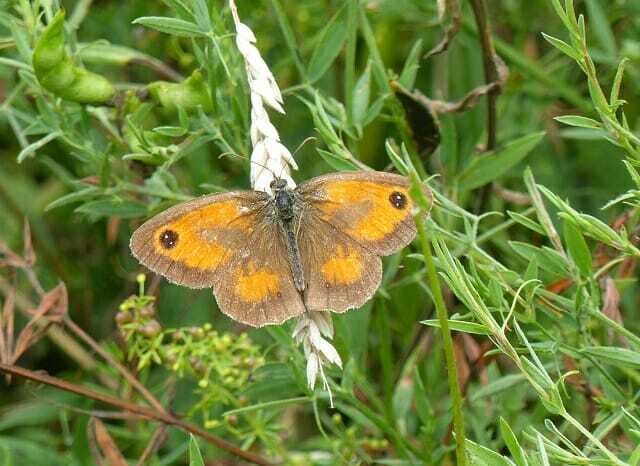 On a still day, if you spend a few minutes, you’ll see butterflies, moths, bees, beetles, spiders, wasps, all still busy in the thick vegetation of the meadow – which may be very dry at its tips, but is still damp in the dark depths at soil-level. 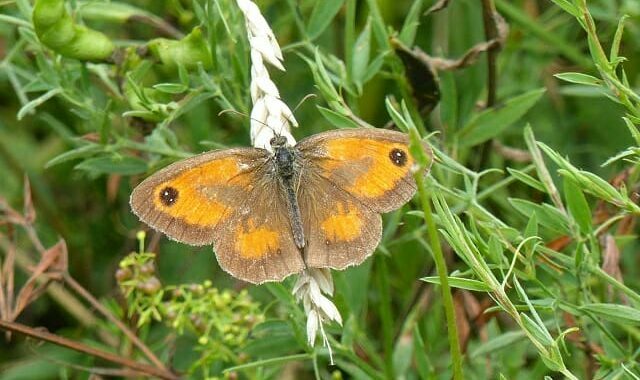 Running from 20 July to 12 August, this is an opportunity for everyone to get involved, learning about butterflies, identifying butterflies, and counting butterflies. It doesn’t take long to download the chart or get the app, then spend just 15 minutes watching butterflies, making a note of every one that you see. 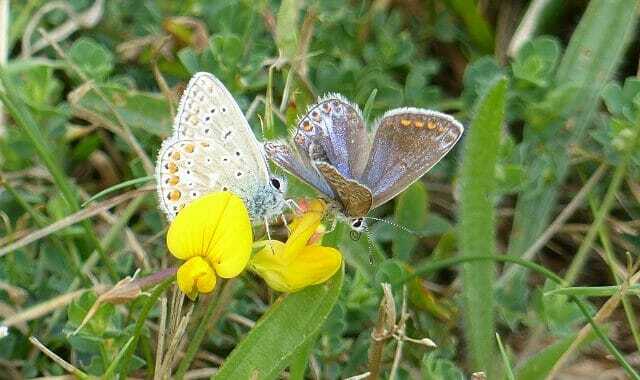 Check out Nick Baker’s YouTube video or go straight to the Big Butterfly Count website. 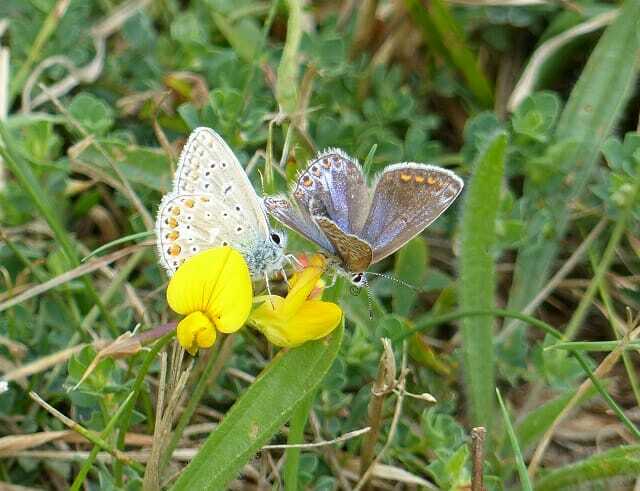 You can do the survey as many times as you like, and the times when you see no butterflies are as important to record as those when you see plenty. It all goes to help the charity know how to help conserve our beautiful and ecologically important butterflies. You can do it in your own garden, local park, at Sun Rising or another favourite spot … What a great excuse to take time out of a busy life, a busy mind, in a busy world, and simply watch the butterflies. In the back of my mind, I recall young Dickon in Frances Hodgson Burnett’s The Secret Garden calling daffodils ‘daffodumdillies’. It’s a word that has stayed in my mind – it is so full of spring sunshine, energy and appreciation. As I’ve not read the book in forty years my memory may be wrong, but what is certain is how strong the daffodil is in our English consciousness, how powerful it is as a signal of spring, of the sun returning, of hope and new life. 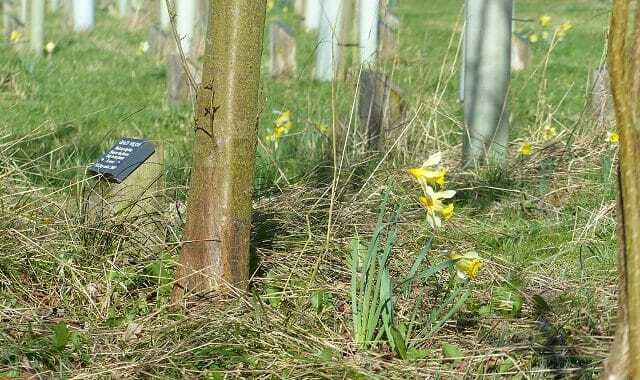 As a nature reserve, the only daffodils allowed at Sun Rising are the native Narcissus pseudonarcissus, the Lent lily. These have pale yellow petals with a darker yellow trumpet, fine grey-green leaves, and in height they are usually no more than 6 – 8″. 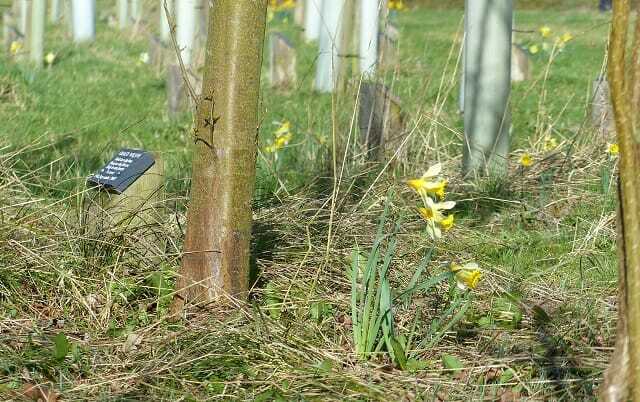 As a burial ground, it’s hard to stop families planting daffodil bulbs. We supply many hundreds each October, but some cultivars still creep in – sometimes large blousy daffs, sometimes the beautiful little golden ones. Sadly, to keep the integrity of the nature reserve, we do remove them, and this is a task for late March and early April. This year we’ve been more fastidious than previously, and for the first year we have removed every bulb that flowers to show it is not the native Lent lily. It is wonderful to look around and see nothing but the wild daffodils. 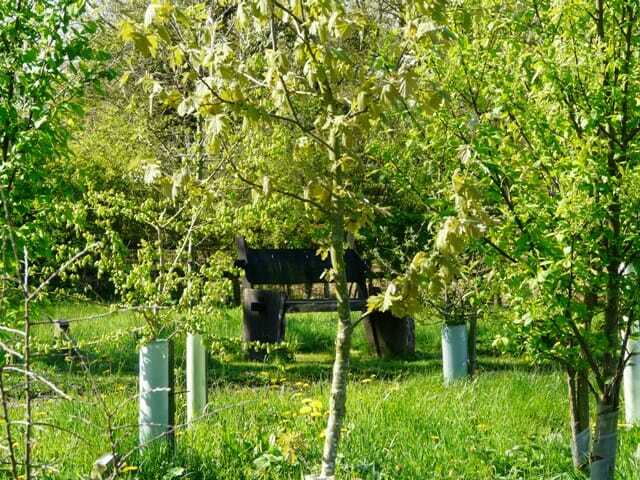 And in October, ever cultivar removed will be replaced with one of the beautiful native ones … As the years go by, there’ll be more and more, as spring comes, with all its promise of new beginnings. Ponds are fascinating places. 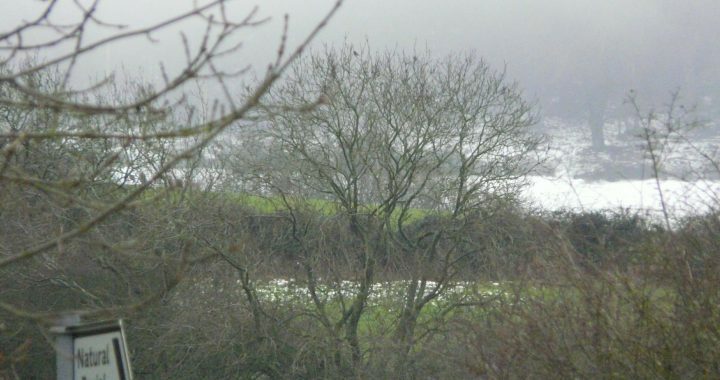 A wildlife pond, unlined and naturally fed, will often dry up during periods without rain, which mean that its inhabitants, both flora and fauna, need to be extremely adaptable. Furthermore, the plantlife in a healthy pond will naturally keep growing until it overwhelms the entire pond, changing the ecosystem entirely. At Sun Rising, the pond is deep enough to retain water, even through long months of drought, which means it remains an invaluable source of water for wildlife locally. 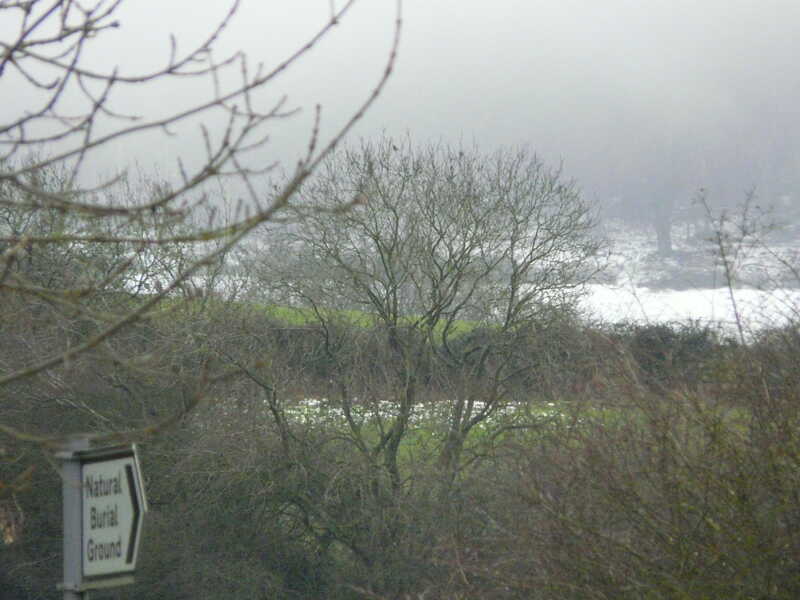 And as a nature reserve, we are maintaining the pond as a pond – which means that now and then, as the plants grow and spread, they need to be reduced. This year was the first time that was necessary, but it will be a task to be done every few years from here on. With thanks to Tim, who volunteered with rather leaky waders, on Sunday the work was done, with a good proportion of the pondweed harvested out. Plants removed will remain on the pond edge for a while allowing the little creatures to slip, slide and crawl back into the water. As a wonderful source of nitrogen, it will then be added to the compost heap. 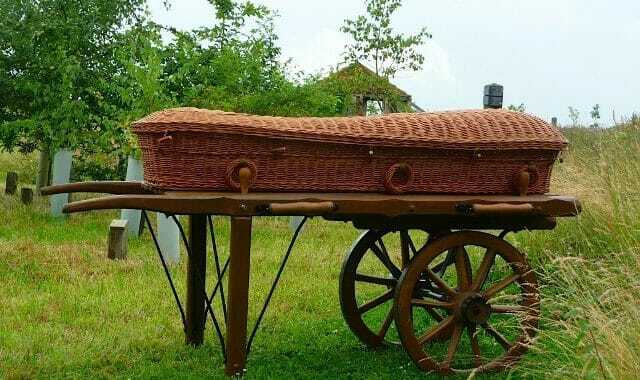 Sometimes I am sent photographs by families who have loved ones buried at Sun Rising, photographs that reach deep into my soul, sometimes with excruciating sadness, sometimes with utter delight, and sometimes a little of both. Here is one that lifts me to a soul-smile and brings tears to my eyes. 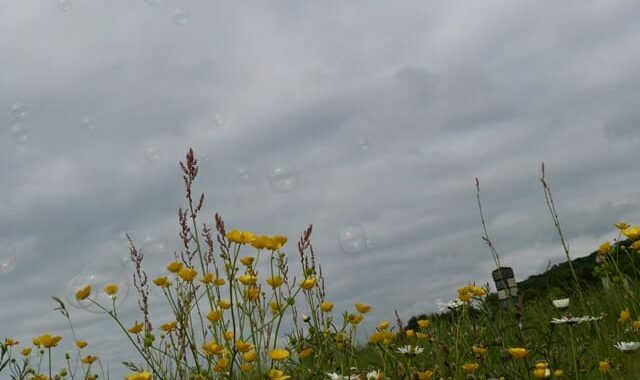 Yes, it is taken at a jaunty angle, but have you tried to operate a bubble machine and take a photo at the same time … ? 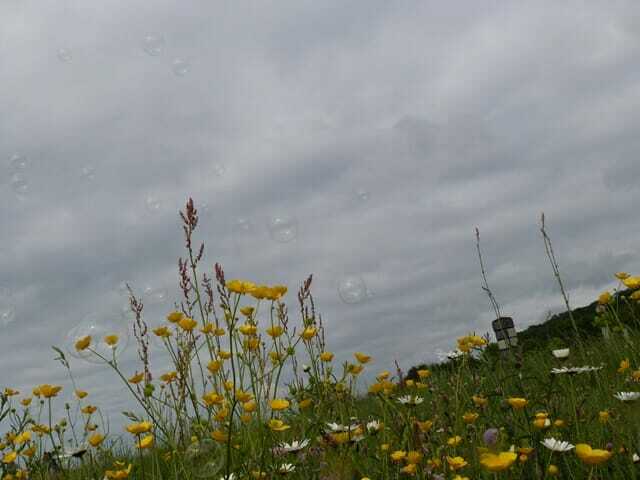 The dramatic cloudscape has been common over these past few days, and above the meadow of buttercups, oxeye daisies, vetch, ragged robin, campion, red clover, plantains and so much more, the clouds are just glorious. The soft yellow-green foliage of new leaves is so beautiful. Its brightness lifts the soul after a long wet winter, and its tenderness reflects our state – still waiting for the summer months to kick in and fill us with energy. 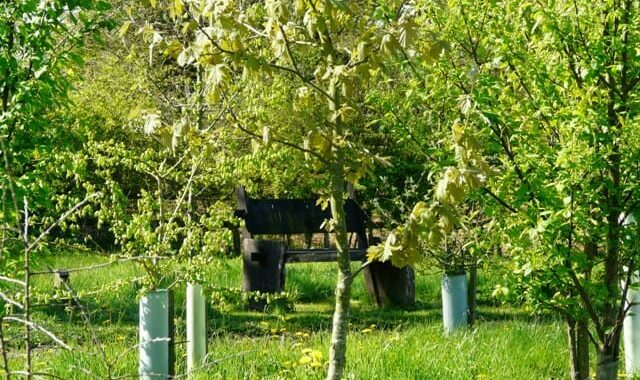 At Sun Rising, seeing the hedgerows green is always a delight, but watching the memorial trees put on their leaves is even more rewarding. Walking around the site, at this time I am checking every tree to check to see if they’ve made it through the winter. Those newly planted last December are now putting out their first little leaves. The cherries are coming into bloom, for some this being their first year of flowering (those that are three or four years old). The trees that are now five or six years old are really coming into their own, with bluebells and wood anemones flowering beneath them. With cowslips and dandelions across the meadows, it is a beautiful time at Sun Rising. Freelance environmental consltant Tim Marlow has been dropping by the burial ground over the last few months, considering the connections between the environmental programme at Upton Estate at the top of Sun Rising hill and the Biodiversity Action Plan folk at Oxhill (OWLS): the burial ground creates part of a corridor between the two. 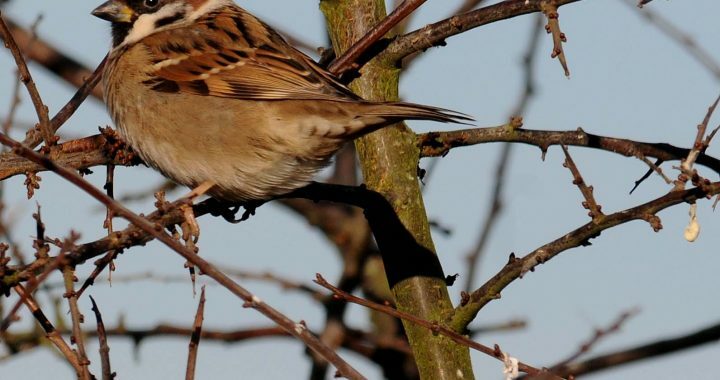 Tim has taken some beautiful photographs, including this sparrow. 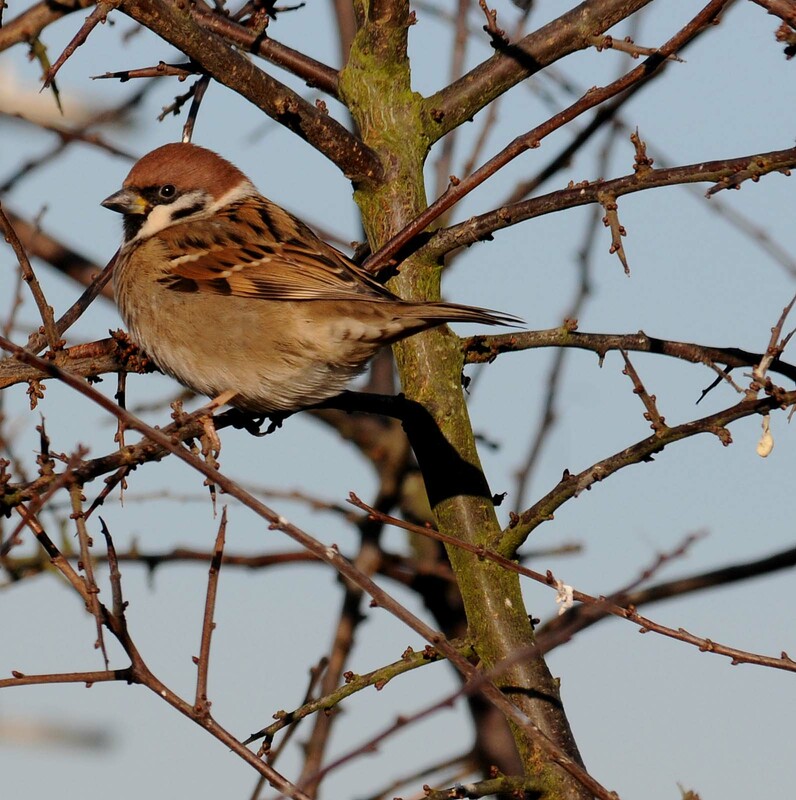 We’ve had more tree sparrows at the site this past year than ever before. Just exquisite.